Browsing the archives for the free tag. I joined up with five other authors (Judson Roberts, Ruth Nestvold, Del Law, William Hertling, and Annie Bellet) to start a contest that runs all this month. First prize is a brand spankin’ new Kindle Fire HD with 13 eBook novels and collections of science fiction, fantasy, and historical fiction. There are also 10 second prizes of three eBooks from your choice of those 13. You can enter the contest up to once each (so a total maximum of three entries) through Twitter, Facebook, and on our contest Web page by simply listing the three books that most interest you from the list. You can enter and get all the details here. Contest books include my own Bam! 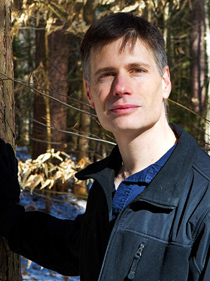 172 Hellaciously Quick Stories and my novel of Vermont backwoods magic, Family Skulls. Some of the other books are William Hertling’s two futuristic AI novels, Judson Roberts’ deeply researched and action-drive Viking trilogy, Del Law’s unique and engaging fantasy novel of humans and non-humans in overlapping worlds, Annie Bellet’s novel of crime in fantasy city called Pyrrh, and Ruth Nestvold’s Arthurian Romance-Adventure novels. Winners will be announced on New Year’s Day, 2013. Enjoy, and good luck! Some time back, my friend Maya Lassiter and I participated in a Codex collaborative story contest and created a historical fantasy story about deadly lights plaguing a small family in post-Civil War Missouri. Even after the story won the contest, we revised and rewrote and rewrote and revised, finally settling on a version that satisfied us both. 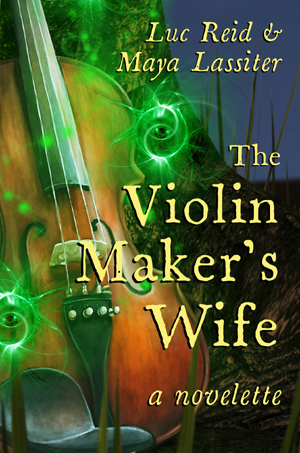 Today and tomorrow (Wednesday through Thursday, November 7th and 8th), our e-novelette “The Violin Maker’s Wife” will be available free on Amazon.com: click here to get it. If you do get and read the story, we’d be very interested in hearing what you think! Comment here or post a review on Amazon. With my fantasy and science fiction short-short story collection, Bam! 172 Hellaciously Quick Stories now available in paperback, I thought it would be a grand time to follow the Goodreads tradition of giving out some copies, and I’ve created a new Goodreads giveaway offering 5 paperbacks of Bam!. You can register for a chance to receive one of these free, autographed copies by clicking on this link: http://www.goodreads.com/giveaway/show/31855-bam-172-hellaciously-quick-stories . If you haven’t already, you’ll need to sign up for Goodreads to enter. (There’s no charge, and the site offers many good ways to find new books you’ll like.) Good luck! This weekend I’ll be attending Readercon near Boston, Massachusetts, and while there I’ll be doing a reading of stories from my flash fiction collection Bam! 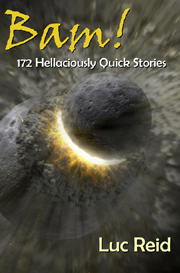 172 Hellaciously Quick Stories. Bam! has been available for Kindle since last year, and the paperback ($11.95) is just coming out now, already available here and scheduled to show up on Amazon.com within the next week or two. In celebration of all this, Bam! for the Kindle (and all devices that can run the free Kindle viewer, including PCs, Macs, iPads, iPhones, Android devices, etc.) will be available free today through Sunday. Feedback, good or bad, is always welcome. Enjoy! My young adult novel Family Skulls, about a 16-year-old trying to break a generations-long curse on his rural Vermont family, will be free on Amazon for Kindle at http://www.amazon.com/Family-Skulls-ebook/dp/B00573Y36W until Monday 12/26. One of the things I enjoyed most about writing this book was conjuring up elements of my Vermont childhood on the page. The story’s hero, 16-year-old Seth Quitman, is much more self-possessed and practical than I was as a teen, but the dirt and gravel roads he bikes down, the house he lives in, and much else are very familiar to me. I also was very fortunate to get the chance for a cover by artist Dixon Leavitt, who managed to bring all of the key elements of the story (like the warmth and occasional claustrophobia of a close-knit family, menace, mystery, and the vastness and brilliance of a starry sky on a dark night) into his piece. I’ll be posting about the development of that cover in the near future. My flash fiction collection, Bam! 172 Hellaciously Quick Stories, is part of an Amazon Kindle promotion and is free just until December 15th: here’s the link. I have a hard time figuring out how the world will end. War? Plague? Alien invasion? Robot insurrection? The gods getting bored? A gentle fade? Cosmic disaster? The possibilities are not only varied, they’re also interesting. If it’s the last day ever, do you reveal your secret crush? What do you do in the last 5 seconds of your life? What if your band’s first good gig ever has been interrupted by the robot insurrection and a little girl wanders into the bar after everyone’s run away in panic–do you give her pineapple juice? 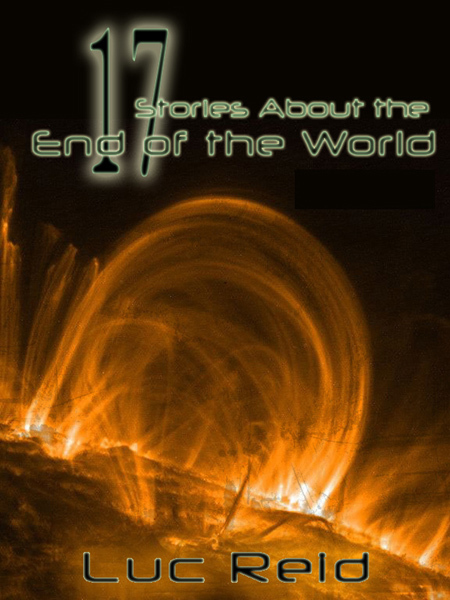 These and other questions kept charging my subconscious with stories I needed to write about the end of the world, and 16 such made their way into my book Bam! 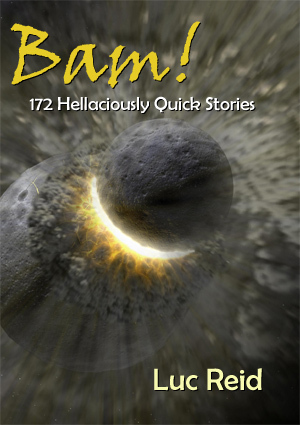 172 Hellaciously Quick Stories for Kindle and other eReaders. 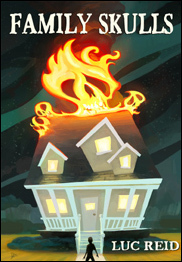 My new, free, eBook, 17 Stories About the End of the World, offers those 16 plus a new one (“The End”). Well, I say free: you can get it for free on Smashwords or for 99 cents on Amazon (authors aren’t given a way to offer a book for free on Amazon, but if you put it up for a price on Amazon and for free on another eBook site, Amazon will sometimes drop the price to free, though it’s hard to say why that should be the only way to do it).